21 Day Fix Meal Plan Spreadsheet - Free Self-Calculating Google Spreadsheet! 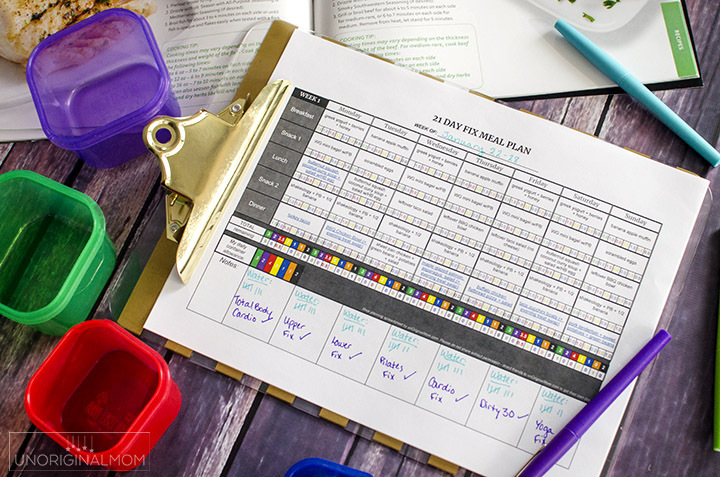 Easily plan out your 21 Day Fix Meal Plans with this free Google Doc version of a 21 Day Fix Meal Plan Spreadsheet! I’m back again with a few more 21 Day Fix tips for you! 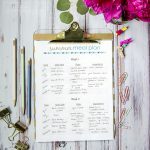 I created this super handy free printable 21 Day Fix meal plan spreadsheet for myself during my January round of the Fix and it made my meal planning SO much easier…so I thought maybe some of you might find it helpful as well! 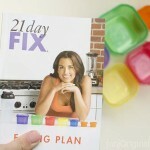 First of all, if you are brand new to 21 Day Fix…or maybe you’ve never heard of it before…or maybe you’re wondering why a mostly-craft/home blogger like me is talking about healthy eating and fitness…you should start here with my 21 Day Fix review. (And it also couldn’t hurt to go check out my About Me page, where I explain why I post more than just craft ideas on this blog!) In any case, you should know that I’m not a Beachbody coach and I’m not trying to sell you anything. I’ve just found this program to be a great tool for getting our family back on track with healthy eating and exercising habits, so I like to share 21 Day Fix tips and ideas with you that I’ve discovered along the way in case you find them helpful, too! Okay, so, meal planning. I actually already have a post about the importance of meal planning on 21 Day Fix, along with some of my favorite meal and snack ideas. 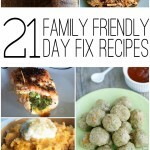 You can read all about that here: 21 Day Fix Meal Planning Tips & My Favorite Foods. 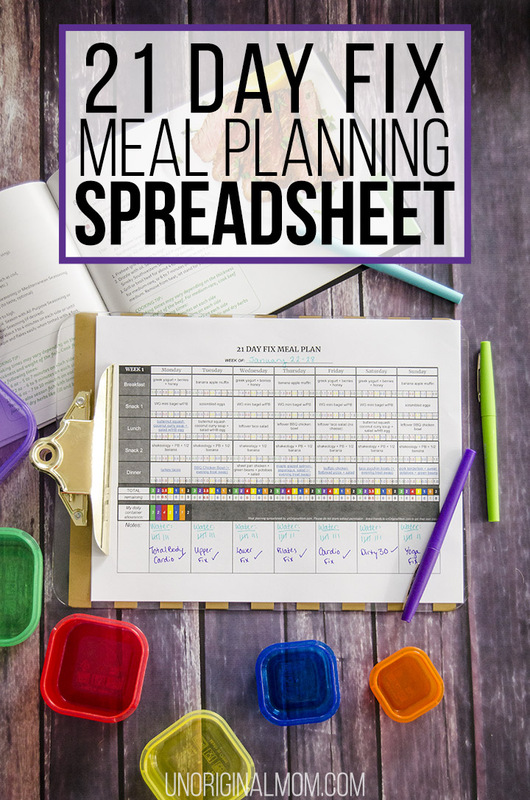 In that post, I linked to a few free printable meal planners that I found helpful for my first few rounds of 21DF…but I’ve always been more of a spreadsheet gal than a pencil-and-paper type of person, so planning out my meals on paper seemed kind of cumbersome. This time around, I decided to create a 21 Day Fix meal plan spreadsheet. 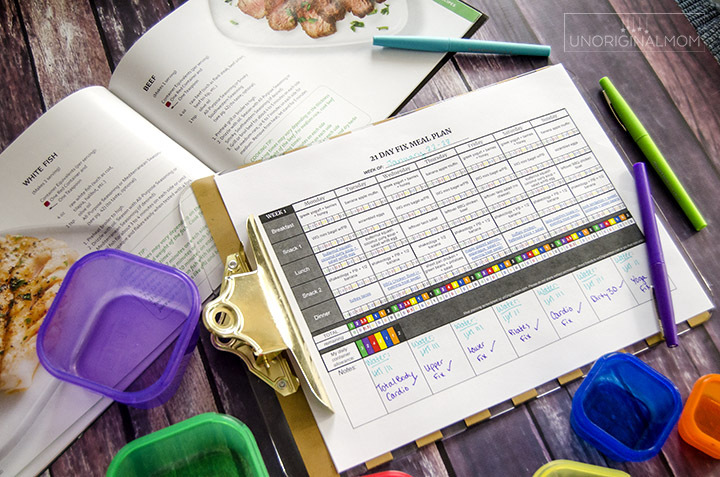 Meal planning on the 21 Day Fix is kind of like a puzzle – you’ve got to make sure that all your meals on any given day fit together perfectly so you don’t exceed any of your daily container counts. When you’re using a pencil and paper and decide to move something around, you’ve got to re-add your containers for the day and make adjustments accordingly. I found I was doing a LOT of erasing and kept forgetting to add one container here or another one there, so the process was a lot more frustrating than it needed to be. Plus if our plans changed for a day and I needed to switch our dinner menu around, it was really time consuming and difficult to make changes. With this spreadsheet, it’s all made a LOT simpler. It will work for any calorie bracket, too – there’s a spot on the bottom for you to enter your daily container allowance. In fact, you can use this planner for ANY of the Beachbody “portion fix” eating plans, not just 21 Day Fix! 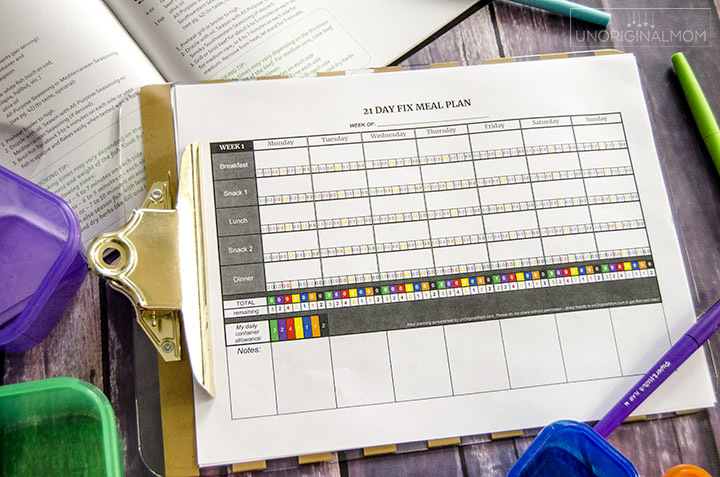 Here’s how to use my 21 Day Fix meal plan spreadsheet: after you’ve entered your daily container allowance at the bottom, start by entering your meals in each box, along with the container count for the meal. I like to begin with my dinners for the whole week first. As you fill it in, you’ll see two sets of numbers at the bottom of the column that will automatically fill in – your total container count for the day, and how many of each container you have remaining. (Important – don’t type into the “TOTAL” and “remaining” boxes, otherwise the self-calculating formulas will disappear!) Then it’s easier to go in based on the containers you have left and add your lunches next (I eat a lot of dinner leftovers for my lunches), then breakfasts, and finally your snacks. But you can do it however you’d like! Then, when you’re done, it’s easy to print out on one page – make sure it’s set to “landscape” page layout. This Google spreadsheet is completely FREE for you to use! All you need to do is open up the spreadsheet via the link below, make sure you’re logged into your Google Drive, then go to File…Make a Copy. Save to your own Google Drive and edit, print, etc! You will NOT be able to edit the spreadsheet without making a copy for yourself, so please don’t request access to do so. Access my 21 Day Fix Meal Planning Spreadsheet here! One important note: please don’t send this spreadsheet directly to anyone else – it’s for your own personal use. If you’d like to share it with friends (or, coaches – if you’d like to share it with your participants), just send them the link to this blog post so they can download their own copy! 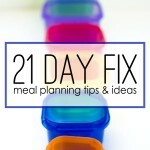 And don’t forget to take a look at my 21 Day Fix Meal Planning Tips! I love the spreadsheet. Thank you. Can you tell me what the black container (column H) is for? I am very grateful to have found your website. I started the 21 Day Fix yesterday; your information will make this so much easier! So glad to hear that Alicia! Good luck with your Fix journey! This spread sheet is awesome. I tried to edit for plan B and it seems that it is no longer calculating the remaining correctly. Is there something else I should have done to make it work? Thanks! You should be able to edit your container counts depending on your calorie bracket all the way at the bottom of the sheet next to “my daily container allowance.” But if you’ve accidentally altered a number in the “remaining” row, then the self-calculating formula won’t work anymore. The easiest thing to do is just re-download the spreadsheet to make sure the formula is correct, or copy it over from another tab in the spreadsheet. Hope that helps!